Make cookies: Whisk together cocoa powder and flour in a bowl. Put butter and granulated sugar in the bowl of an electric mixer fitted with the paddle attachment. Mix on medium-high speed until pale and fluffy, about 3 minutes. Mix in egg until well blended. Reduce speed to low. Add flour mixture; mix until just combined. Divide dough in half, and shape each half into a disk; wrap in plastic. Refrigerate until firm, about 1 hour (or overnight). Preheat oven to 350 degrees. Transfer dough to a work surface lightly dusted with confectioners’ sugar. Roll out dough to 1/8 inch thick. Cut out cookies using a 2-inch round cookie cutter; space 1/2 inch apart on baking sheets lined with parchment paper. Repeat with remaining scraps of dough. Bake cookies until firm, rotating sheets halfway through, 10 to 12 minutes. Let cool completely on sheets on wire racks. Meanwhile, make ganache: Bring cream to a boil in a small saucepan over medium-high heat. Add chocolate. Cook, stirring constantly until chocolate is smooth. Stir in peppermint extract. Let cool slightly, 10 to 15 minutes. 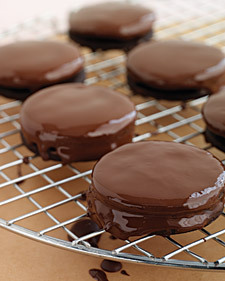 Spoon 1 teaspoon ganache onto the bottom of 1 cookie; sandwich with another cookie. Repeat with remaining cookies and ganache. Refrigerate until firm, about 10 minutes. Make glaze: Melt chocolate in a heatproof bowl set over a pan of simmering water, stirring constantly. Let cool slightly. Dip one flat side of each sandwich into melted chocolate to coat; gently shake off excess. Place sandwiches, chocolate sides up, on wire racks set over baking sheets. Refrigerate until set, about 15 minutes.